This junction is at the start of the 'Kings Mile'. It's pedestrianised in the daytime. Actually people used to walk on the road anyway, so the big ugly boards are only confirming what was beginning to be established fact. Ahead is a road called `The Friars', leading down to the Marlowe Theatre that can just be seen in the distance. Left is into Guildhall Street leading back into the centre of the city. 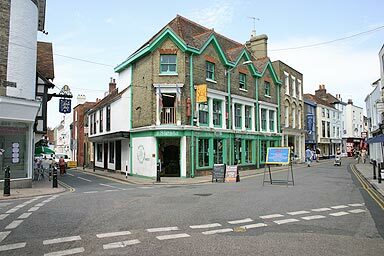 Right is Palace Street.